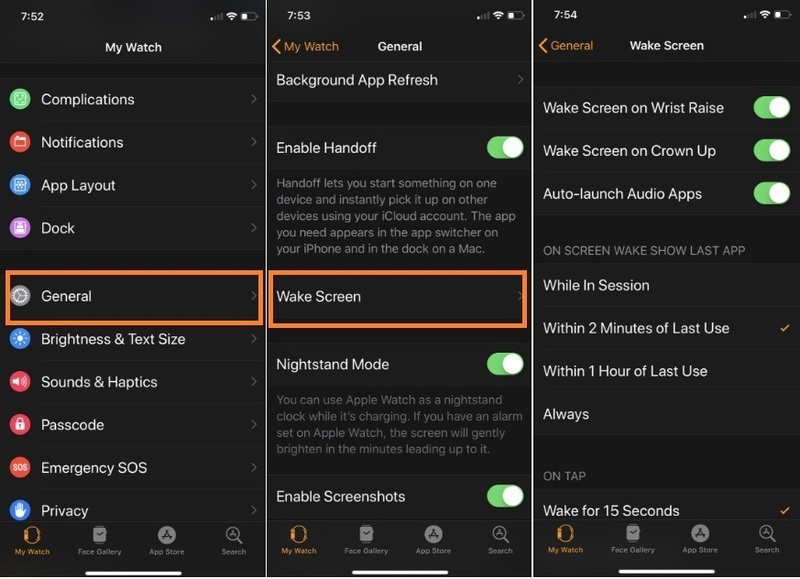 Do you have a question that how do I Customize my Apple Watch Wake Screen Settings? Your idea is so nice because now you can do it on your Apple Watch with or without iPhone. Generally, Apple Watch screen goes in sleep mode whenever you are not working with it. Even though, some of the superior features for Apple Watch to waking it up most comfortable. For instance, by raising your wrist, tapping on Apple Watch screen, as well by seeing automatically the last app you launched. Now, go ahead few steps and Customize your Apple Watch Wake Screen using mentioned Guide. Step #1. Open the Watch App on your iPhone, or you can open Settings on your Watch. Step #2. Next, Scroll down the screen Tap General. Step #3. Again, Scroll down to tap Wake Screen. One of the ideal way to wake you Apple Watch. As you might using this way to perk up your Apple SmartWatch automatically. Enabled wake screen on wrist raise toggle Apple Watch is always ready to give wake screen functions to its wrister like you. Tap on General > Watch Orientation to make your selection right or left. Then, enable the Wake Screen on Wrist Raise option by moving the toggle to green. Best for control Music, audiobook, Podcasts on the go, instead of picking up your phone to control playback via control center on the lock screen. Easily get last opened up, for example, you leave the calendar app, and for a reason, you don’t see on your watch. Then after you activate your Apple Watch screen that time, it will instantly show you Calendar App. In this section, you can see two options included Wake for 15 seconds and Wake for 70 seconds. We can say this is the battery saver feature for the Apple Watch.